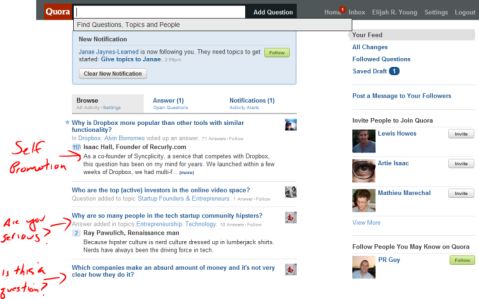 Is Quora the Next Big Social Media Site? Are you considering using Quora? Has all the buzz got you wondering if it’s worth it? Keep reading for my full review. There you have it. Quora is what happens if every Wikipedia article was turned into a Jeopardy question and then answered with the same Wikipedia article, although much less accurate, completely subjective and much more self-promoting. Too many of the answers are self promotional here. I’m not inviting Lewis Howes to this… He’s already on a better platform—LinkedIn. Of course this was just my first impression of Quora. After some prodding and poking, I decided to check the place out for myself. Let’s see how close my initial thoughts were to reality. Quora calls itself a “continuing collection of questions and answers created, edited, and organized by everyone that uses it.” Which sounds great until you register and see the stream. The truth is that Quora is organized more like a trunk full of toys that a group of five-year-olds continually use, edit and organize as they see fit. Never fear, because unlike most children’s rooms, Quora has a great search function and gives really good information once you’ve narrowed down on a question. 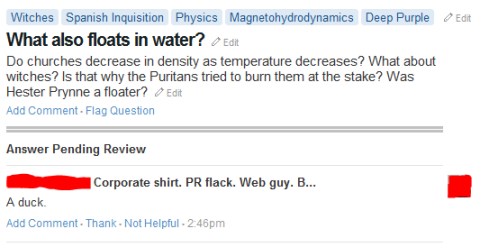 In fact, despite my sarcasm, Quora has a number of fantastic opportunities for the social media ninja out there. 1. Quora is a great place to find content ideas. Don’t know what to blog about? 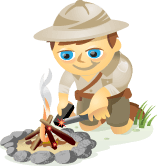 Find out what your audience wants to know about your industry, and blog about that! Quora can be a great market research tool for bloggers to make sure that their content is relevant to their actual audience, and not just a good idea to them. 2. Quora is a great place to find experts. The one thing Quora has a lot of is experts. Every question has a democratically voted-on “Best Answer,” and by consequence, “Best Answerer.” Connecting with these people will give you tons of experts in an industry to pick the brain of or hobnob with. Which brings us to Quora’s next benefit. 3. Quora provides networking opportunity. It’s tough being a “nobody” in any industry, but networking with the smartest and most popular of the bunch is a good way to increase your own visibility. Quora gives you the chance to connect with experts—not only on Quora, but also on the social network of the expert’s choice, depending on how many of their social networks they’ve connected to their profile. 4. Find joint venture opportunities on Quora. The real benefit of Quora has nothing to do with questions and answers. The real power is connecting with very smart people to do business together. If I were to use Quora as a strategic resource, I would only connect with “Best Answerers” and try to do joint venture deals with them. They’re already ambitious, as they’re staking claim to a social network that’s only popular with die-hard social media users. They’re investing time hoping that Quora works out, so they shouldn’t have an issue investing in a joint venture deal for the promise of a future benefit. And finally, it’s likely that they have, or are trying to grow, an audience for their expertise, so you can offer to showcase them to your audience in return for the same or another benefit. It ain’t all sunflowers and origami Swans. As much as I’d like to end this article with all of the benefits of Quora, the truth is that there are some glaring holes in the platform, as there are with any new social platform. Let me bring you up to speed. 1. There is such a thing as a stupid question. Poo poo also floats in water. Next question. Stick to targeted searches, my friends. 2. Quora is the self-promotion capital of the world. You knew this was coming. The point of your business is to make profit. You get profit from customers. And you get customers by being the best, or just positioning yourself as the best. Unfortunately this kind of member has cheapened the experience and potential of Quora. No one answers questions for the greater good of the question; everyone has an angle. Wikipedia had it right—keep it about the info. Quora isn’t there yet. Not even close. 3. Wait, have you heard of LinkedIn Answers? I wasn’t joking earlier. Nothing about Quora screams unique. LinkedIn Answers is more professional, it’s already tied to your professional profile and there are already 100 million users there. Now I’m all for competition, but the simple act of allowing users to vote answers up or down doesn’t make a new platform. 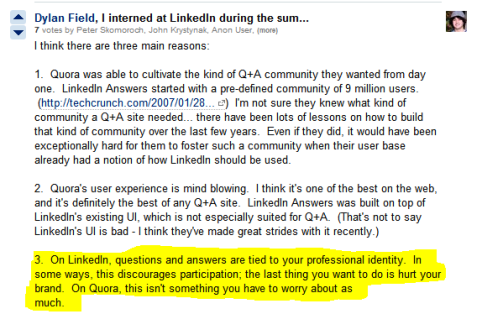 Besides being completely wrong (Quora allows you to tie all aspects of your professional life into your profile), as a marketer, why wouldn’t you want something you say to be linked to you professionally? The only reason that I can think of is that you’re saying something you shouldn’t be saying, or you don’t know what you’re talking about. Finally, a difference! On Quora, maturity and accountability are optional. I know I sound negative, but think about this. There’s already a place where you can get answers from professionals, then look at their profile to connect with them for more information, and learn their life story. It’s called LinkedIn, and it’s pretty awesome. Apparently 100 million people agree. Also, there’s already a place where we’ve decided to organize the world’s information so high-school and early college students don’t have to study nearly as hard as they tell their parents they are. It’s called Wikipedia, and it already has a pretty awesome community that’s working on that whole “keeping the information awesome and reputable” thing. Add that to the fact that they already have a kind of voting system where inaccurate info just disappears. Oh, and they have to use footnotes too. We need to end the habit of creating platforms that are simply the same as platform ‘x’ but with feature ‘y.’ It’s not worth the time or effort, nor is it particularly useful to anyone to uproot their presence or add another burden to their social media plate. The only thing Quora introduces that makes it different from my previous two examples is ego and peer pressure. Now I can add my name and my brand to the knowledge that I’m giving the world. Now I can publicize that it was me who knew the most about industry X on Twitter, and every other social platform that we’ve been trying to take the ego out of for the past 2 years. And after that, I can bring my swarm of Twitter followers to the platform to ensure that my answers are voted to the top, giving me the title of Smartest Question Answerer Ever, and possibly even acquire the Power of Grey Skull. Quora is an adolescent version of two platforms that we already have mature versions of. What’s that saying? “When I was a child, I spoke as a child…”? Well ten years ago, I would have LOVED Quora, but hopefully, the social media industry is mature enough to realize we have the solutions we need to be successful, and not abandon them for something new and shiny for new-and-shiny’s sake. Have you used Quora yet? How was your experience? I’d love to hear your take on social media’s newest “it” platform. Leave your comments in the box below. Elijah R. Young is the lead strategist and owner of Social Talk Live. He's also a business strategist who helps existing and new companies promote and grow their business.